Calling all bingo lovers looking for a way to play their favourite game from home. 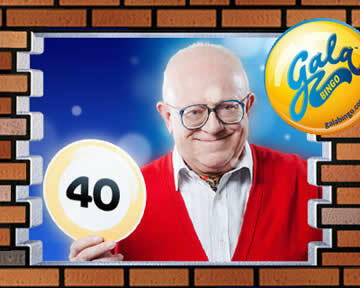 We review the Gala Bingo online site where you can win real money! Why Play Gala Bingo Online? What Do You Get at Gala Bingo? What are you looking for in an online bingo site? Exciting games, thrilling bonuses, monster prizes? Or high speed, high octane entertainment where everything is easy to do from buying cards to collecting winnings? Then you will likely want to read this review to find out everything you need to know to get up and running and enjoying the amazing gaming experience that Gala Bingo provides for its members. Before I get into all the great aspects of this premier bingo site, let's take a moment to consider what has caused you to go looking for an online bingo game. After all, it can't replace the atmosphere and ambience you get from a live hall full of avid players marking off their cards to a real live caller calling out the balls as they are released, now can it? But that's not why people play this game online. It's the same game, for sure, but in a totally different environment. And that makes it highly interesting to try out. For most players, once they've tried it, they want to play more. So why would a person who loves this game want to play at the online version of Gala Bingo when they can get an arguably more exciting and "real" live experience at one of their brick and mortar halls? Convenience: You can play from the comfort of your own home on a home computer or laptop without ever having to leave your comfy chair. Speed: Online games are played really fast, so there's no waiting around for individual balls to be called. Hands-Off: At the start of each game, the numbers are released and your card is automatically marked for you with the entire thing over in seconds. If your card has a winning line or wins the overall game, your winnings are automatically added to your account balance. Time Saving: Not everyone wants to spend a whole evening playing bingo! When you play online at Gala, you simply buy your cards for the day's games and go off and do something else. You don't need to watch the games play or even be logged into your player account. Everything is done automatically and your winnings added without you needing to interact at all. Engaging: Of course, most players will want to watch the games play out and its fun to watch them zip through really fast and your winning line come up, or see your card win the main game and some pretty amazing prize money get added to your account as it happens! Different players will have different reasons for wanting to play online at Gala, but these are the major attractions to the game. Here's the interesting part for would-be new members to this site. I'm assuming you already know a little about how the game of bingo is played in a real-live environment so I'll skip the total newcomer to the game stuff in this paragraph and include it further down the page. There is a pretty useful new player sign-up bonus you can take advantage of. When you deposit your first £10 you can claim a further £30 to spend on buying cards or anything else that you fancy at the site. The bonus is redeemable according to their terms and conditions, which I recommend you read through to familiarise yourself with them. When you're a new player at Gala, you can access the Newbies Room where you can get to play free games that you can win real money at. This is a great way to introduce yourself to the game and how it's played online at this site! Of course, the prizes won't be life changing amounts. After all, what do you expect for free! But they are worth winning because they will help boost the level of funds in your account. That's money you will be able to use to buy cards for the big money prize payout games as soon as you're ready to start playing! There are several scheduled games played throughout the day at Gala as you'd expect it to mirror to some degree the live set up. The big difference here is that instead of a few games that you'd expect to play at a live hall (time constraints limit the number of physical games that can be played), you can access more than 600 online bingo jackpots each and every day! Lucky Numbers: Lucky by name, lucky by nature. This is a great game to start playing as its pretty simple but can yield top prize money! Deal or No Deal: This game mimics the popular TV game show hosted by Noel Edmonds. A great way to line yourself up for a big payout with great prize money up for grabs. Coronation Street: What's this? A game that has the UK's most popular soap as its theme? You bet! How can you resist the temptation to get involved in a game that has all your favourite elements built-in with major prizes to be won? The answer is: You can't! That's just a taster of what you'll be able to access once you are a signed up member and playing at this premier site. What's more, with so many prizes to play for, members enjoy the chance of sharing in the over £2,000,000 payouts every day. That's a huge amount of prize money up for grabs. If you want a share of it, you need to get playing right away because there will be over £2m paid out in prize money today, tomorrow and every day after that. That's more jackpots than you'll find at any other online bingo site. 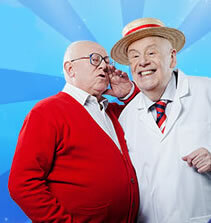 Now you know why Gala is the No.1 online bingo site in the UK! Anyone who is a member of Gala Bingo can refer a friend to the site and claim a very respectable £20 cash payment for each friend you refer. All they have to do to qualify is sign up, make their first minimum deposit and start playing! There is no limit to the number of people you can refer, so here is a chance to make this a lucrative side-business that you can run and get paid for doing. 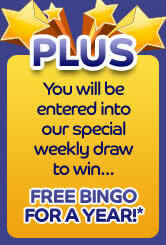 Plus you will be entered into a free prize draw to win a fantastic prize of free bingo for a whole year! The great thing about this aspect of the site is that you can actually earn extra cash simply by getting your friends to sign up and join in the fun! If you are totally new to the game and have never experienced playing bingo at a live hall or in an amusement arcade or similar situation, here are some simple game play rules and pointers to get you up and running. You start with a card that has a selection of 15 random numbers printed on it that correspond to the 75 or 90 numbered balls that will be drawn for the game depending on which game is being played. The numbers are called out one by one as the balls are randomly released. When you have a matching number on your card, you simply mark it off. If you complete a line of numbers, you call "House" and you claim the prize corresponding to the line game. If you complete more lines, you win the prizes for those lines and if you complete the entire card, you win the main game prize. Online bingo works in much the same way. The big difference is you don't have to wait for individual balls to be released, called and then mark them off your card. It's all done automatically for you and the entire game is completed in the space of a few seconds. If you have won any of the lines or the full card, your winnings are added to your account automatically. You can then cash out any time by withdrawing your winnings or a percentage of them. If you want to keep some in your account to keep playing more games with, you simply don't withdraw it all. To play online, all you need to do is sign up for an account, deposit at least the minimum amount and you can start playing by buying cards for the day's games right away. Once your account is active, you can add more funds to it or withdraw winnings easily whenever you choose. You can sign up by clicking your mouse on the advertising banner below to open the appropriate page at the official Gala Bingo website with my compliments! PS: Online bingo is not for everyone and maybe it's not for you. You don't have to sign up with Gala Bingo if you don't want to. But consider what you might be missing out on if you stay on the fence... Just do what you want to do!